Some dogs are natural swimmers, while others are not. Even individual dogs from breeds that are known for their swimming prowess, such as Labrador Retrievers, can struggle when it comes to getting into the water. Listed here are water safety tips for dogs. All dogs must learn how to swim, just like humans. Never toss your dog into a pond to teach him or her to swim in a “trial by fire” method. Not only is this technique extremely dangerous, but it can emotionally scar your pet. Start with short water introductions. Use treats and positive reinforcement when standing in a shallow area of a pond or pool. Support your dog by placing your hands beneath its chest while he or she learns to doggy paddle. 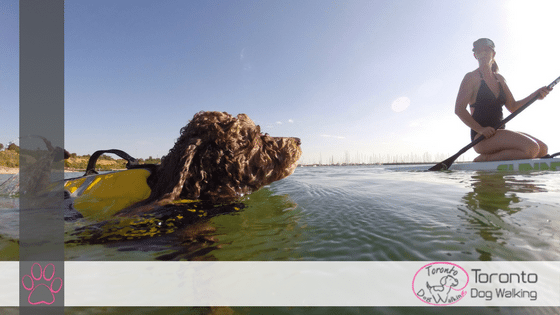 Toss a ball or stick into progressively deeper areas of water, and always supervise your pet. If your dog has special needs or is diagnosed with a disorder such as epilepsy, talk with your veterinarian about whether swimming is safe for your pet. For instance, epileptic dogs can have a seizure while swimming, causing them to drown. Swimming is a highly energy-intensive exercise that can leave even healthy dogs worn out, so it is important to be extra cautious with special pets. Even if your dog is a strong swimmer, investing in a life jacket is important, particularly if you and your dog frequently engage in open water activities. Some dogs will never feel comfortable in the water,such as American Bulldogs and other breeds that have large bodies and short legs. For these animals, a life jacket is an absolute necessity. As a dog grows older, his or her swimming ability will decrease, and all dogs will have difficulty seeing at night, making a life jacket important in these situations. When moisture becomes trapped inside a dog’s ears (particularly for floppy-eared dogs), bacteria and yeast are given the perfect environment to grow. Ocean and lake water can introduce bacteria into a dog’s ear canal, leading to dangerous infections. Talk to your veterinarian about safe ear drying and ear cleaning solutions that can be used after a dip in the lake. Although sandy beaches are fun for humans, they can be dangerous for dogs. Broken shells, dead fish filled with sharp bones, and poisonous sea animals such as jellyfish all pose a hazard to pets. Beaches can also contribute to roundworm and e.coli infections, among others. Use caution on beaches and make sure your dog is obedient to recall and the “leave it” and “drop it” commands. Even if your dog is comfortable in water, it is important that he or she is always safe. If you have an in-ground pool, invest in baby fences or other barriers that will keep your dog out of the water if you are not there to supervise. Additionally, if your dog were ever to fall into an in-ground pool, it is important that he or she knows how to exit. A dog can easily drown while trying in vain to jump out of a pool. Teach your dog how to access steps or a ramp, and re-teach your dog these skills every new swimming season. Dogs do not know how to tread water, and will continue swimming until they become exhausted. Keep an eye on your pet at all times and recognize the signs of exhaustion in your dog. Additionally, keep the water temperature in mind. If you are exiting the pool or lake because you are getting cold, it is highly likely that your dog is cold as well. An animal that experiences hypothermia can quickly drown if the signs are not caught in time. A medium or large sized dog that is panicking in water is not only a danger to itself, but to any humans that try to rescue him or her. Avoid jumping into the water to save your dog, which could lead him to him or her jumping on you and taking you under. Instead, use a calm voice to guide your dog to a safe location.